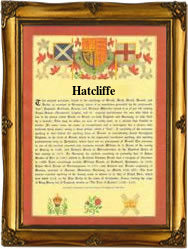 Recorded in several forms including Hatcliffe, Hatliff, Hatlife, Hatliffe, Hattiff, and others, this is an English surname. It is locational from the village of Hatcliffe, in the county of Lincolnshire, and is first recorded in the famous Domesday Book as "Hadeclive." This translates, according to the Oxford Dictionary of English place Names as "Headda's slope," with Headda being apparently an early personal name. We believe that a more likely explanation is a fusing of the pre 7th century Olde English "heap dun cliv," which would mean the heather covered hill side. Unfortunately without actually being present some thousaand or more years ago when the name was given, it is quite impossible to give an accurate and literal explanation as to what was meant at the time. Locational surname are usually "from" names. These were names given to people as easy identification after they left their original homesteads to move somewhere else. Spelling being at best indifferent and local dialects very thick, lead to the creations of "sounds like" variants. Examples of recordings include Ursula Hatcliffe, christened at Grimsby, on August 4th 1546, during the reign of King Henry V111th (1510 - 1547), Thomas Hateleffe at Healing, Lincolnshire, on February 21st 1569, George Hatliffe who married Ann Balden at St Botolphs Bishopgate, city of London, on April 4th 1656, and Thomas Hattiffe at Long Sutton, Lincolnshire, on April 13th 1730.